Novotel Wollongong Northbeach has devised the perfect summer escape for families, with a Jamberoo Family Fun Package that includes overnight accommodation for two adults and two children, full buffet breakfast for everyone, a family pass to Jamberoo Action Park, a family munchies pack, car parking and late check-out all from just $399 per room per night. 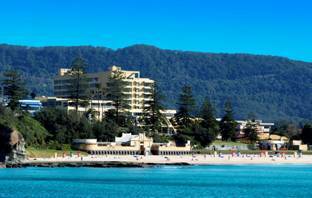 Located right on the beach and just over an hour south of Sydney, Novotel Wollongong Northbeach boasts excellent leisure facilities including a pool, spa and sauna, day spa, restaurant and two bars plus a fully equipped gym. During school holidays the Novotel runs a Kids Club that offers a range of activities to keep the young ones amused. Children can enjoy dinner, games, movies and arts and crafts every night during the NSW school holidays (excluding Christmas and New Year's Eve), while their parents relax. Jamberoo Action Park is the largest theme park in NSW and offers a day of thrills and spills for the whole family including the exciting Taipan giant water ride for the dare-devils, Outback Bay, Billabong Beach, mountain toboggans, a 300m chairlift and the Jamberoo Express train plus mini-golf, water slides, go-karts and much more. Wollongong and the Illawarra region provide plenty of activities for families including surf lessons, snorkeling, white water canoeing, fishing, mountain biking, horse riding and more. A trip to Robertson on the Cockatoo Run steam train is also a popular day out, while for the more adventurous, a tandem sky dive will deliver you to the doorstep of the Novotel, landing right on the beach in front. Other attractions including endless bushwalking trails and scenic picnic spots, the Nan Tien Temple and historic Mount Kembla Village, mean families will never be bored.